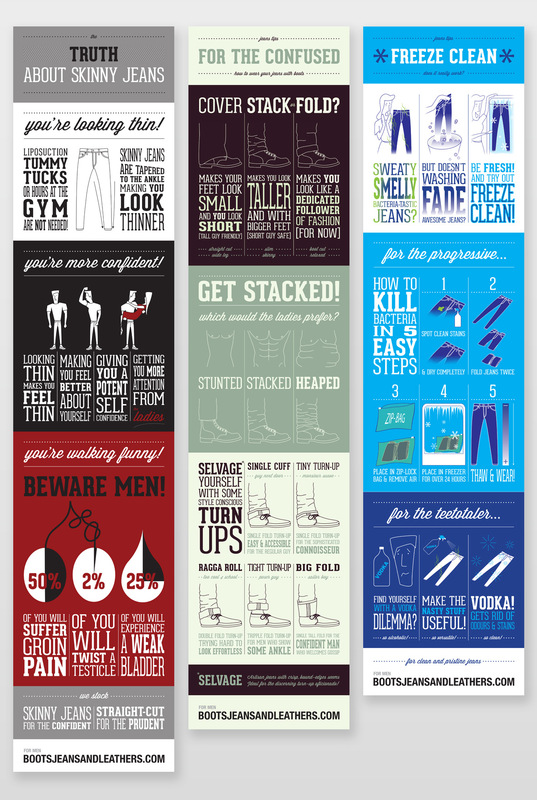 The brief called for a series of infographics on three topics; skinny jeans, how to wear turn-ups and cleaning options for jeans. These would be seeded one at a time to the web with the aim of getting extra publicity for the client and generating more site traffic. These infographics were produced for Ebow client BootsJeansAndLeathers.com. After receiving the brief, the project was mine to run. I was charged with researching the topics, writing the copy and creating the illustrations and layout. After frequent checkpoints with the client for review and feedback, the designs were signed-off. The copy is kept short and snappy, with lots of humour. The designs pair bold typography with vector line illustrations that amplify the humour. "Your infographic is now being discussed on FORBES… That's one HELL of a back link we just got!!" For little outlay, BootsJeansAndLeathers.com got great media coverage and a boost of visitors to their site. Within 48 hours, the infographic had been pinned over and over, was featured on TrendHunter.com and to some surprise, even got reviewed on Forbes.com. To note, the piece was actually based on reported medical issues as discussed in Medical News Today but it was deemed unimportant to cite this. I have a lot of questions. 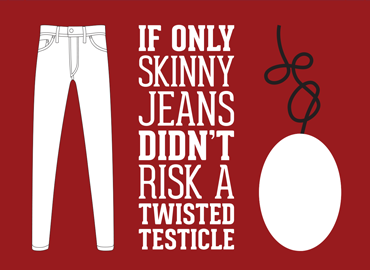 First, why would anybody think making me contemplate twisting a testicle would encourage me to buy tight pants? Also, that 50% statistic seems rather damning and really high, why include it? And the weak bladder thing? I’m not even sure what constitutes a weak bladder, but are they really asserting that my pant choice is integral in maintaining bladder strength? Where do these numbers come from? Though many infographics display hard-hitting information and statistics with huge implications, it’s nice to see a piece of data visualization that doesn’t take itself too seriously. With the potential to change minds about men in tights pants, this infographic is a fun read.